Discussion in 'Parallels Toolbox for Mac' started by AndyTheJunkFoodKing, Nov 8, 2018. 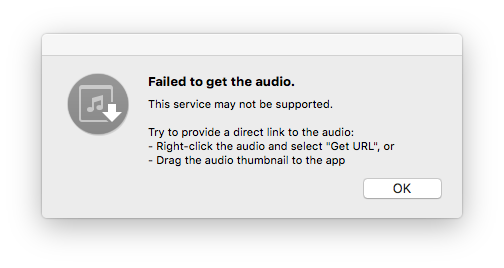 Hello, i'm trying to download audio from Youtube but i get this error on every video i try. It seems in the recent update you guys fixed the video downloader but now the audio download isn't working. Hi @AndyTheJunkFoodKing , did you try downloading Audio from any other websites? could you please provide us with link to video on youtube? Also you need to generate technical report (open Toolbox --> press on cogwheel button --> Help --> Send Technical Data), send it and post it's ID here. Sometimes youtube changes the way how video/audio is stored. We need to look at the video link and your report to understand what can be done here. Thanks for sending technical details report. We're investigating your issue. You guys fixed it! thank you so much! It's def my most used tool in the Toolbox, too bad websites change their API often. Well thanks again! Hi @AndyTheJunkFoodKing , thank you for letting us. Glad that your issue is resolved. Please let us know if you were trying to download any videos uploaded by VEVO channel in youtube. I had the same issue as Andy. However, my problem was that the video I wanted to download the audio from was in my "Watch Later Playlist". After removing the video from the playlist I was able to download the audio. I noticed that the URL of the video was different when watching it from the playlist. Hope this helps with fixing the issue! i think they may have changed their API again. i'm not able to download audio from Youtube. Here is the ID number 294658118 for the technical report. P.S sorry for always asking you guys to fix it so much but the Audio/Video download tools are my most used tools in the Toolbox. It's pretty much the whole reason why i have a subscription. > i think they may have changed their API again. i'm not able to download audio from Youtube. yes, we know about it and currently working on fix. Anyway, thanks for reporting the issue.